Written by Theodore Brown, Jr.
John Overton, trusted friend and advisor to Andrew Jackson, was an early Tennessee lawyer, jurist, banker, and political leader. Born in Louisa County, Virginia, Overton moved to Mercer County in present-day Kentucky in 1787 to begin his law career. He boarded with the family of Lewis Robards and his wife Rachel Donelson Robards, whose subsequent divorce and marriage to Andrew Jackson, Overton defended. 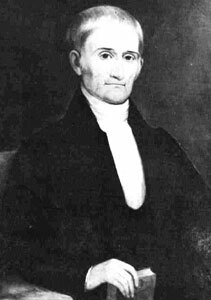 Overton moved to Nashville in March 1789 and began practicing law in the Davidson County court; he was admitted to the bar in April 1790. He lodged with young Jackson, who was in the early stages of his own legal career, and the two frequently worked together to represent certain clients. The personal and professional relationship between the two men expanded into a business partnership in May 1794, when Overton became Jackson’s partner in land speculation. Overton represented Sumner County as a delegate to the 1789 North Carolina convention to ratify the U.S. Constitution. In 1795 he received an appointment from President George Washington as supervisor of revenue for the District of Tennessee, Territory South of the River Ohio. The following June, Washington appointed Overton to the post of district inspector of the revenue. Between 1803 and 1806 Overton, as agent for the state of Tennessee, negotiated a settlement with North Carolina regarding the latter’s right to dispose of land located within the new state. Under the terms of Overton’s compromise, Tennessee ceded most of the western third of its territory to the United States, agreed to recognize land warrants that had been issued by North Carolina, and obtained clear title to the remaining land within its bounds. In August 1804 Overton was elected to succeed Jackson as a member of the Superior Court of Tennessee, the forerunner of the Tennessee Supreme Court. He served on that court until January 1810 and was one of the judges of its successor, the Supreme Court of Errors and Appeals, from November 1811 until his resignation from the bench in 1816. In collaboration with Judge Thomas Emerson, Overton published the initial two volumes of the Tennessee Reports (1813-17), the first official compilation of published decisions by Tennessee’s highest courts. Judge Overton owned a substantial law library (in 1808, his collection contained some 160 volumes) and apparently served as an agent for eastern publishers of law treatises. Cumberland College awarded him an honorary Doctor of Laws degree in 1825. After his resignation, Overton married Mary McConnell (White) May in 1820. He returned to the practice of law and to tutoring prospective new lawyers at his home, Travellers Rest, before turning his attention to his substantial business interests and to promoting Jackson’s political career. Reputed to be one of the wealthiest men in Tennessee, Overton had engaged in the slave trade and by 1819 had become leader of the powerful Blount-Overton political/banking organization. As head of the Nashville branch of Knoxville’s Bank of the State of Tennessee, Overton and his fellow bankers opposed the resumption of specie payments and the adoption of small-debtor measures that followed the national depression triggered by the Panic of 1819. Their opposition contributed to the landslide election of William Carroll, the anti-bank candidate for governor in 1821, and to the eventual closing of the Blount-Overton banks. As a founder of Memphis (1819) on land he owned with Jackson and General James Winchester, Overton devoted a substantial portion of his later years to promoting the new town’s growth and development. Whenever Jackson’s interests were at stake, Overton was on hand to ensure that they were represented and protected, if not promoted. As a young lawyer, he handled legal and business matters for Jackson. In late 1821 or early 1822 Overton helped organize the Nashville Junto, a loose committee of Jackson’s closest personal friends, to plan and promote the general’s election to the presidency. In 1822 Overton joined with Felix Grundy and mobilized the Blount-Overton faction in the Tennessee General Assembly to nominate Jackson for president. Overton used his personal knowledge of the facts surrounding Jackson’s controversial marriage to draft an effective brief defending Jackson against the bitter personal attacks during the 1828 presidential campaign. Overton remained an intimate political advisor to Jackson throughout his first term as president. Although his resistance to Jackson’s choice of Martin Van Buren as a running mate in 1832 concerned some of Jackson’s other lieutenants, Overton was selected as chairman of the Baltimore convention to renominate the president. Ill health prevented his acceptance of the position. Though independent and occasionally rebellious when it came to his relations with Jackson, Overton was viewed as a family member, and the two men remained close to the end. According to tradition, Overton’s last words were of Jackson.